In these sections the stories take a rather abrupt turn. 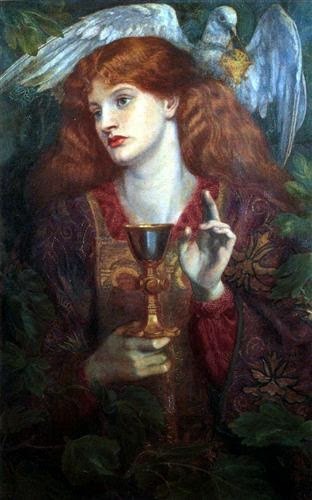 Gawain decides to declare a search for the Holy Grail (Sangreal) at the drop of a hat, and while all the knights are rather enthused, Arthur is upset ……. somehow he knows that this will be the end of his Round Table as many knights go forth to die in the quest. There are a number of interesting adventures, but these battles and odd happenings are no longer light-hearted and gay, but instead are coloured with a kind of melancholy air. Visions permeate everyone’s thoughts, everyone’s sleep, and hermits abound with dire warnings, wise advice, or noble sayings. 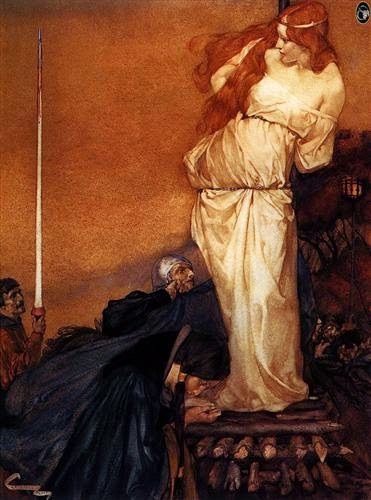 Lancelot learns that all his endeavours and all his fame has been won for Queen Guinever instead of for God, and our worthy knight is sorrowful, realizing the littleness of his human achievements without a greater vision. 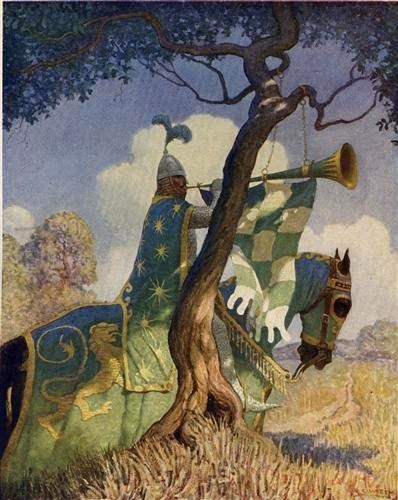 We get stories about Sir Percival, Sir Gawain, Sir Bors, and, of course, Sir Lancelot. Poor Gawain. His sense of honour had never been strong, and least of all his perseverance. He soon becomes fatigued with searching for the Sangreal —- even though it was his idea in the first place —– and is somewhat petulant because he’s met with hardly any adventures. When he meets an old hermit and inquires as to the cause of his bad luck, the hermit proceeds to enlighten him: he’s a no-good, despicable murderer who is a dishonourable knight and full of sin, therefore he will never find the Sangreal. I kind of like these old hermits ……. they don’t mince words. Finally the relationship between Guinever and Lancelot is exposed by Mordred, Arthur’s son, for completely nefarious purposes. 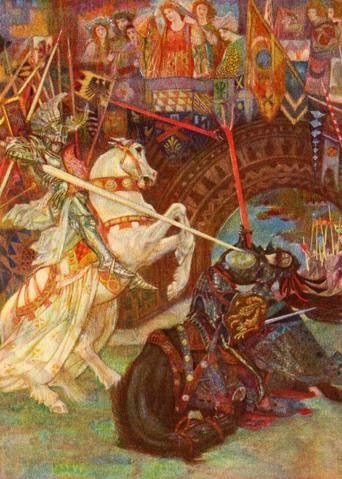 Lancelot returns to France but Arthur follows to do battle, leaving the kingdom in the hands of Mordred. What myopic reasoning for a great king! Mordred immediately plots to take over, Arthur returns and both he and Mordred kill each other in battle. 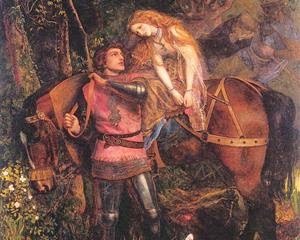 Lancelot attempts to reach the kingdom in time to assist Arthur but is, of course, too late. Well, perhaps I should have written more about Tristram in my last post as his adventures seem never ending. He is the son of King Mark of Cornwall’s sister, but the king eventually decides to hate his nephew, from what I can gather, simply for being such a successful knight. Before I’d read this book, I’d read of Tristram’s treachery with regard to his relationship with King Mark’s wife, La Belle Isoud, but Malory gives us some revealing information. Tristram actually saw and fell in love with Isoud first, but when King Mark heard of her beauty from Tristram, he was determined to have her. 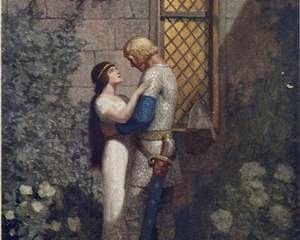 And what should an honourable knight do but bring back his lady love to be his king’s wife? Then, of course, the two of them (Tristram and Isould) drink a love potion and carry on behind the king’s back. And on and on …..
King Mark finally gets a glimmer of suspicion: “Then king Mark had great despite of the renown of Sir Tristram, and then he chased him out of Cornwall: yet was he nephew unto king Mark, but he had great suspicion unto Sir Tristram, because of his queen, La Beale Isoud: for him seemed that there was too much love between the both.” Well, no kidding. I guess he just missed the time they were caught together and Tristram had to jump naked out of the window. 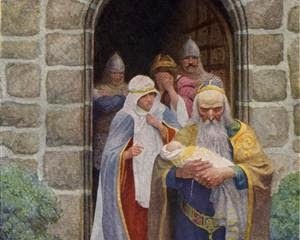 And the time that Tristram stole Isoud and took her to stay with him in a castle, must have just slipped king Mark’s mind. In any case, king Mark is a despicable scoundrel, always trying to slay Tristram and even sneaks into King Arthur’s court in disguise to pounce on his hated nephew. Malory seems to undergo wild changes of topic in these sections. “And so they let run their horses, and there Sir Palamides bare Archade on his spear over his horse tail. 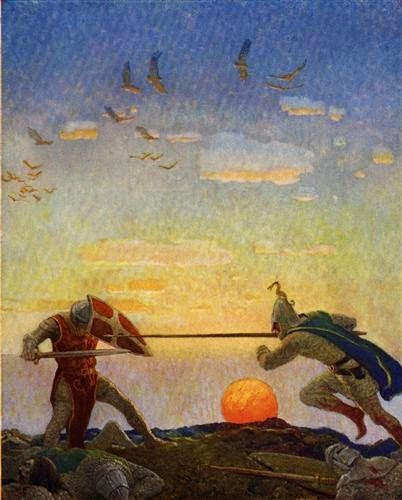 And then Palamides alight, and drew his sword; but Sir Archade might not arise, and there Sir Palamides rased off his helm, and smote off his head. Then the haut Prince and Guinever went to supper.” It’s like riding in a car and having the brakes suddenly slammed on. You have to be prepared. A lesson to learn: do not feed knights food they dislike. “Then they blew to lodgings, and the knights unarmed them, and drew them to their dinner; and at the midst of their dinner in came Dinadan, and began to rail. Then he beheld the haut prince, that seemed wroth with some fault that he saw. For he had a custom he loved not fish; and because he was served with fish, the which he hated, therefore he was not merry.” And if you don’t like your dinner, throw a tantrum. Otherwise, we have more shenanigans between Palamides, the Saracen knight, and Sir Tristram. 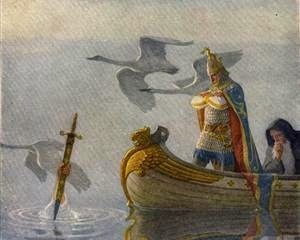 A sword appears in a floating stone and Arthur commands Gawaine to pull it out, in spite of a curse placed on the ones who cannot complete the task. He is unable and Percival follows to share in his curse. 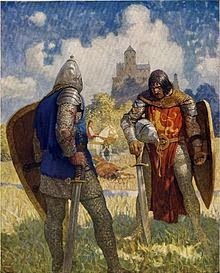 However, Galahad, the son of Lancelot, acquires the sword and with it the title of the greatest knight in the world. Galahad seems a somewhat different knight from the rest and his adventures are more measured and more focused on good. In any case, there are lots of knights running after each other, trying to seek each other, hermits and visions and such. 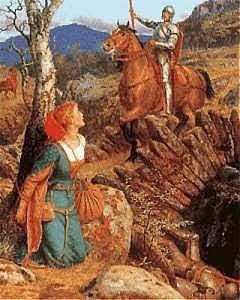 Lancelot begins to realize that his life has been spent in unworthy occupations, which is the start of his repentance. And, of course, so begins the quest for the Holy Sangreal! It has been appearing and disappearing at will, and Gawaine invents the marvellous idea of a quest. 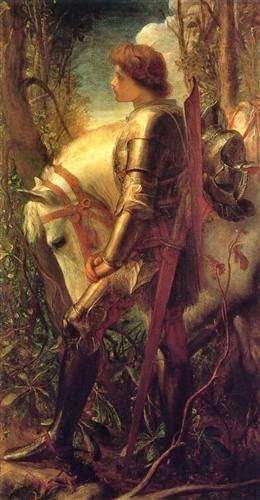 Arthur is wroth and woeful, as he sees all his knights leaving him and knows in his heart a great number will not return. Definitely a sadder, more pathetic aura has fallen over the tone of the book at this point. I’m into the last stretch of the journey and am both excited and hesitant to see what it will bring! Okay, this book just keeps getting stranger and stranger. 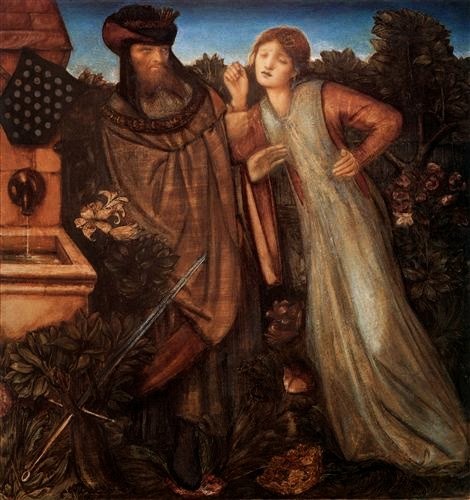 In this section, the reader first gets the honour of following Lancelot on his journeys. We have more incidents of kidnapped knights, devious damsels, murderous giants, prison escapes and vengeance. It always amazes me that these knights can be in the middle of a fight to the death but still manage to hold polite conversation with one another. I’m still unclear as to the chivalric rules of when you kill a knight and when you let him live. Do you only let him live if he’s honourable? What if he’s honourable, yet he’s offended you? I’m not sure. And why, for heaven’s sake, do Knights of the Round Table fight each other? Because there’s no one else handy? Well, back to Lancelot …… our trusty knight further spent his time cutting cloth and stealing swords from corpses; refusing to kiss ladies who perished from their sorrow, and suffered foiled attempts at rescuing ladies from their murderous husbands who finally manage to lop off their heads. Ay me, what fun! Beaumains arrives at court and has a fight with the greatest knight Sir Lancelot. He nearly defeats Lancelot and only gives over when Lancelot promises to knight him. 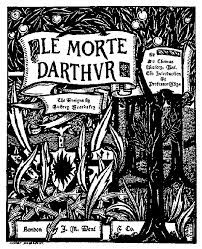 He does this without Arthur’s knowledge, nor does he reveal that Sir Beaumains is actually Sir Gareth, the younger brother of Gawaine and Gaheris. I have given up asking why in this book. Eventually Beaumains announces that he loves the lady’s sister, Liones, which doesn’t seem to bother Linet, but apparently the lack of knowledge of Beaumains’ identity does bother them, so, with their brother’s help, they decide to steal his dwarf. That’s right. Beaumains’ dwarf. Why they didn’t just ask Beaumains who he was, remains a mystery. Well, our good Beaumains arrives at the castle to demand the return of his dwarf and the culprits comply since they have discovered that Beaumains is Gareth, son of a king and nephew to King Arthur. The sparks fly between Liones and Gareth and they pledge their love to each other. Are you with me? Good, because it gets better …… or worse, as the case may be …….. That night while sleeping in the hall on a couch (apparently knights need no better sleeping arrangements) a mysterious knight appears, he does battle with Gareth, and Gareth, even though severely wounded in the thigh, lops off his opponents head. Disgusting, yes, but there’s more. The lady Liones arrives, then her brother, but when Linet appears she immediately plucks up the head, smothers it with ointment, does the same to the neck, and then sticks the two together, whereupon the knight pops up and Linet takes him to her chamber. Enough, right? Malory could not possibly continue the comedy. But he does. The next night, the knight with the re-attached head attacks again and this time Gareth takes no chances. Once again, beheading him, he chops the head into hundreds of pieces and tosses his fleshy confetti out of the window. Does this faze Linet? Not one bit; she runs outside, gathers up the pieces and once again, by some sort of sorcery, re-assembles the hacked up knight. One wonders what would happen if she missed a piece …….. In any case, does this sound like a family you would want to marry into? Well, Gareth does eventually marry the Lady Liones. I guess it could come in handy having a healing sorceress as a sister-in-law. As to the benefits of a rouge dwarf-stealing brother-in-law, I’m not sure ……. 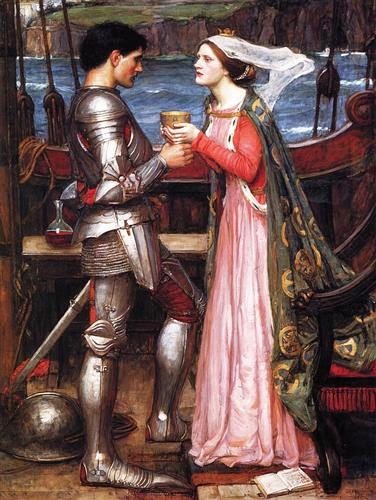 Sir Tristram is also introduced to the reader in the last book and we learn of his love for La Belle Isould. Again, it’s rather confusing and this post is getting long so we’ll perhaps save their shenanigans for next time! So, all in all, an interesting read and I must say I’m enjoying it better than when I started. My favourite story of this section is, as you can tell, the story of Sir Gareth. My favourite name? Definitely King Anguish of Ireland. His name brings a sort of brotherly emotion to the spirit of the read!